I have the same skirt and I love it. I think it is the perfect maxi skirt to play around with, and it will mix well with most wardrobes. I'm totally intimidated by the maxi trend, too! But I love it, so I know I'm going to have to just go for it. You look great! I love the sweater with that skirt. Great combo. I am in love with long skirts right now. This is gorgeous. It's PERFECT! Love this look from top to bottom. Thanks for the link! Oh wow, I really love this look! I like the sweater/skirt together, and I love the belt. It just looks great, really! yes...fabulous skirt!!! i have been searching for a maxi and haven't been able to find the right one. i didn't see any of these at F21??!! I just bought this skirt! I'm still in the awkward stage with maxi skirts. It just feels like a lot of fabric to me. I really love the way you styled this! Wow, not seen you in that silhouette but it looks amazing. I love how the belt adds some detail and moves your waistline up a little. Looking good. I absolutely love the elegant evening-meets-casual vibe of this look! I really love your outfit! I would like to try the maxi trend, but I'm also quite intimidated by it. You wear it well! I also like the color combination of your outfit, very pretty. such a cute sweater, I love that! I love the maxi look and really want to add a skirt to my wardrobe. I had a long gray one from Forever 21 and I believe I gave it away a couple of years ago. Shame on me! 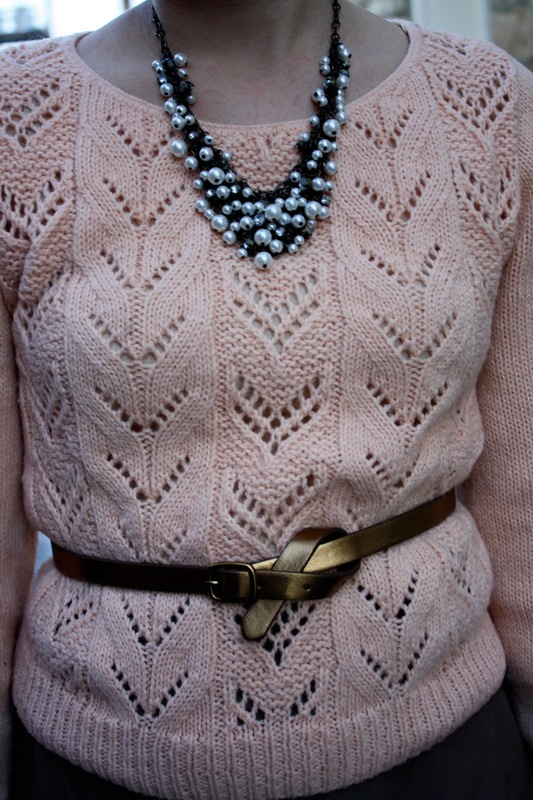 Love the way you styled it with the pink and bronze. I'm now on the hunt! I love this! I've been recently inspired for wintry maxi-dress wearing by Kyla, and I really love what you've done with it here. It's perfect with that sweet, cozy sweater. Great colours together, and love the necklace. This one felt a little Mrs. Robinson to me, the belt, is so cute. Like the closest you could get a belt to looking like a bow. Well done Kansas. Catching up on your old posts... I love this outfit! Though being only 5' it would be really hard for me to pull off, I will defintiely use this as inspiration and recreate using my wardrobe pieces. Now I wish I would have included a maxi in my 30 for 30 picks. Oh well, theres always next month!